It seems to be my philosophy over and over again that when it comes to an art installation bigger is usually better. Large works of art can be a huge investment. Don't get me wrong, I love and appreciate all kinds of fine art and am willing to sacrifice many things in order to save for a special piece. The reality is that sometimes we need to find creative ways to come up with a large installation at a low price. After all, a good mix of high and low makes the best interiors. There are several sources on the internet for all kinds of free printable art. The price doesn't get any better than that. The above botanicals were downloaded from The Painted Hive . This blog has several options when it comes to free printable art. I do recommend printing them on card stock paper. The following are just some examples of economical frames that would work great for this project. 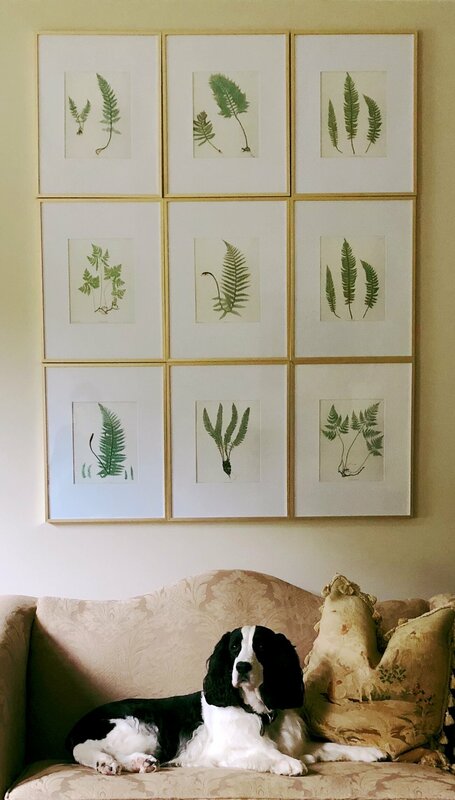 I Love this grouping of botanical prints shown in Harpers Bazaar. You could easily achieve this using the free botanical printables. If you wanted to add three more, don't be afraid to repeat three. Once they are hanging in a group it will not be noticeable. This project definitely provides a lot of impact for very little effort and money.